Four years ago, I wrote this piece in response to the artwork Lullaby by Sheena Graham-George. Today I am going to see the follow-up piece Voices of the Cillin. Art, of course, is a subjective thing. We bring ourselves to it, and depending on our life experiences thus far, we might respond with anger, with joy, with amusement, with melancholy, or maybe with boredom or non-comprehension. I don’t think anybody could have responded with indifference to the art installation I saw today, because every single one of us was, or is, a child. Lullaby, by Sheena Graham-George is at first glance a simple piece, comprising thousands of paper butterflies pinned to the wall of a first floor room in The Orkney Museum. They sweep around the room in a great swarm, high and low, crowded in some places, breaking away in others. The floor is bare, but the air is filled with sound; through a discreet speaker, a female voice sings an unaccompanied, wordless melody. I didn’t recognise the tune, but I would guess that it is an Irish lullaby. The piece is inspired, you see, by a visit made by the artist to Ireland, to study the cultural phenomenon known as the cillìn burial grounds. These areas of unconsecrated ground, often hidden away on the wrong side of the churchyard wall, were the final resting place for unbaptised children, as well as suicides, shipwrecked sailors, and others of the dead who could not, for whatever reason, lie in holy ground. Graham-George spent time seeking out these strange places, many of which are disappearing without trace. Because the burials were often unmarked, and memories fade, sometimes all that remains of these poignant spaces are dips in the ground, mounds of earth, or small unmarked stones. She discovered that mothers who gave birth to stillborn children would often be so ashamed that the burials would be carried out at night, and in secret, away from the judgemental eyes of society. Running parallel to this sad tradition run the Irish folk tales, wherein the soul is represented by a white butterfly. Butterfly-souls that can cross into the otherworld can be found in many ancient belief systems, but in the case of Ireland, it applied particularly to the souls of dead children. These were the two themes – the cillìn, and the butterflies, that the artist brought together when she created this work. The butterflies in Lullaby are between 1-3 inches wide, and are cut out of paper. Even if they had been plain white, the effect of them swarming joyously across the walls would have been powerful enough; but look closely and you discover that they contain text, and black and white illustrations. Drawn in to read the words, you find that they are all from classic works of children’s literature – Mary Poppins, Alice’s Adventures in Wonderland, Peter Pan. These books are often the touchstones of our childhoods, and many of them are stories that engage with the magical, involving children that can enter different worlds, or enable them to have special powers, like the ability to fly. Pulled in by these echoes from past, my eyes were caught by the name Mary Lennox, character from one of my favourite childhood books, The Secret Garden. Mary’s garden was a place where she found joy and acceptance; the contrast with the resting places of the unbaptised children was heartbreaking. 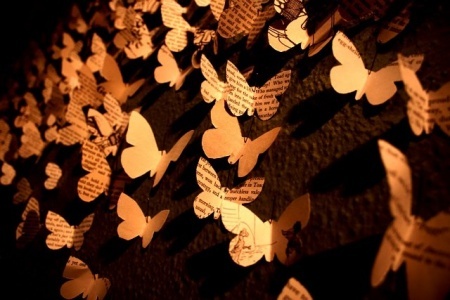 Reading as many of the paper butterflies as I could before my eyes began to ache, it struck me that they were all utterly individual – no two were alike. Some were crammed with excited dialogue – others had a few simple words, or no words at all – just a pen and ink drawing of a small hand, or a tree, or a scruffy little dog. The differences between them gave every single one a personality; it was as if the creation of the butterflies had given all these children a voice of their own, at last. This feeling of childhood recreated is also apparent in the way that the butterfly swarm flows across the wall. In some places they are crammed happily together, jostling for position whilst still surging forward. Others have broken free and are flying off to the edges of the room as if to explore this world of space into which they have been released. I stood back into an alcove, butterflies to the left and right and above me, and imagined them flitting by me, brushing my face with their paper wings. All the while, the lullaby played; the same soothing, simply melody, over and over again. It could have been any mother, singing to any child, but the sound seemed very personal and intimate, helped perhaps by the fact that I was the only person in the room. In the corner on the floor sat two wooden boxes of butterflies, unpinned and packed together. I picked a few up and looked at the rough cut edges, trying to work out how long it must have taken to make them; who did them? Did Sheena Graham George create them all, or did she enlist the help of small hands to help her? I had to resist the urge to take a handful and throw them into the air and watch them fall. I resisted too, the desperate need to put one in my pocket and take it home. I imagine that many women, and men, might feel the same; particularly those who have suffered the melancholy, pain and perceived shame of miscarriage, terminated pregnancies, stillborn children, or infertility. I am not alone, it seems. The comments in the visitors book reveal how much the artwork has touched people – several were moved to tears, others found it soothing or calming. This beautiful, simple artwork commemorates little lost souls; and in doing so, it finally gives them a home.